Mundo Lindo ends the last week in May after 2 years. 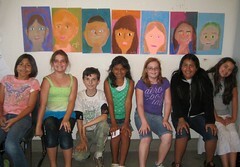 Here's a really sweet photo of the Tuesday kids with their chalk pastel self portraits. I'm going to miss the kids and the program. Jane, you've done such wonderful things there, and the kids are richer for it. I really, really hope you're gonna write that project book.